This article is about the sixth generation of the Chevrolet Corvette (C6). For general Corvette information, see Chevrolet Corvette. 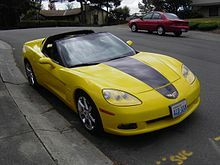 The Chevrolet Corvette (C6) is the sixth generation of the Corvette sports car that was produced by Chevrolet division of General Motors for the 2005 to 2013 model years. It is the first Corvette with exposed headlamps since the 1962 model. Production variants include the Z06, ZR1, Grand Sport, and 427 Convertible. Racing variants include the C6.R, an American Le Mans Series GT1 championship and 24 Hours of Le Mans GTE-Pro winner. The Corvette C6 featured new bodywork with exposed headlamps, revised suspension geometry, a larger passenger compartment, a larger 5,967 cc (364.1 cu in; 6.0 L) V8 engine and a higher level of refinement. It is 5.1 inches (13 cm) shorter than the C5, but the wheelbase was increased by 1.2 inches (3 cm). It is also one inch (2.5 cm) narrower. The new LS2 engine has a power output of 400 hp (298 kW) at 6,000 rpm and 400 lb⋅ft (542 N⋅m) of torque at 4,400 rpm. Like the C5, the Corvette C6's suspension consisted of independent unequal-length double wishbones with transverse fiberglass mono-leaf springs and optional magnetorheological dampers. With an automatic transmission, the Corvette achieves 15 mpg‑US (16 L/100 km; 18 mpg‑imp) / 25 mpg‑US (9.4 L/100 km; 30 mpg‑imp) mpg (city/highway) of fuel economy; the manual-transmission model gets 16 mpg‑US (15 L/100 km; 19 mpg‑imp) / 26 mpg‑US (9.0 L/100 km; 31 mpg‑imp) mpg of fuel economy. The Corvette's manual transmission is fitted with Computer Aided Gear Shifting (CAGS), obligating the driver to shift from 1st gear directly to the 4th gear when operating at lower RPM. This boosts the EPA's derived fuel economy thus allowing the buyer to avoid paying the "gas guzzler" tax. GM badges were added to the car in 2006. Beginning with the 2008 model year, the Corvette received a new engine, the LS3. With displacement increased to 6,162 cc (376.0 cu in; 6.2 L), power was increased to 430 hp (321 kW) at 6,500 rpm and 424 lb⋅ft (575 N⋅m) of torque at 4,600 rpm, or 436 hp (325 kW) and 428 lb⋅ft (580 N⋅m) with the optional vacuum actuated valve exhaust. The previous Tremec T56 transmission on manual Corvettes was replaced with a new version, the TR6060, in the 2008 model year. Manual Corvette models now had improved shift linkage; the automatic model was set up for quicker shifts, and (according to Chevrolet) accelerates from 0 to 60 mph in 4.0 seconds, faster than any other production automatic Corvette model. From 2008 onward, the steering was revised for improved feel and the wheels were updated to a new five-spoke design. The last Corvette C6, a white 427 convertible, was completed on February 28, 2013. Optional 1LZ, 2LZ, and 3LZ trim packages. For the 2011 model year, the Z06 carbon edition was introduced, which carries over multiple parts from the high performance ZR1 including carbon ceramic brakes, active suspension, and other carbon fiber aerodynamic pieces. Only 500 were planned for production and actual production numbers were much lower, in total only about 250 were made. The 250 were optioned the same but did not have the carbon hood. In 2012 and 2013, these options could be ordered through the Z07 package on the Z06. The ZR1 is the high performance variant of the Z06 was first reported by several print and online publications, based on rumors that General Motors was developing a production version of the Corvette above the Z06 level under the internal code name Blue Devil (named after CEO Rick Wagoner's alma mater, Duke University). The car was originally rumored to feature a supercharged LS9 engine having a power output of more than 630 hp (639 PS; 470 kW). The October 12, 2006 issue of AutoWeek published photos by photographer Chris Doane of a C6 Z06 with special auto-manufacturer-issued license plates with a hood bulge, widely thought to confirm the presence of a supercharger on the Blue Devil. Other names attached to the project included Corvette SS and Corvette Z07. In February 2007, a worker at a Michigan shipping company posted pictures online of a powertrain development mule that was being shipped to Germany, believed to be part of the Blue Devil program. The car had manufacturer's license plates, carbon-ceramic disc brakes, enlarged fender vents, a hood bulge, and an engine with a positive-displacement supercharger in the valley between the cylinder banks and a water-to-air intercooler atop it. GM began to release details on the Blue Devil project in April 2007. The company confirmed the existence of the project in an interview with Car and Driver on April 13. Engine power levels were confirmed to be between 600 and 700 horsepower (447 and 522 kW), but contrary to prior rumors of a supercharged 6.2 liter engine, the engine was only confirmed to have greater displacement than the 7.0 liter LS7 in the Z06. Motor Trend confirmed the official name for the production version of the Blue Devil, resurrecting the old ZR1 nameplate. The ZR1 had originally been used on developmental cars in 1971, and again as ZR-1 as the top of the line variant of the C4 Corvette. General Motors officially introduced the Corvette ZR1 on December 19, giving a press release and photographs of the car. GM confirmed a supercharged 6.2 L LS9 V8 having a power output of 638 hp (647 PS; 476 kW) at 6,500 rpm and 604 lb⋅ft (819 N⋅m) of torque at 3,800 rpm. A test of the ZR1 on the German autobahn revealed a top speed of 192 mph (309 km/h), although the manufacturer claims the car is engineered to attain speeds up to 205 mph (330 km/h). Carbon fiber is used on the roof, hood, fenders, front splitter, and rocker moldings; the hood and fenders are painted over, while the roof and splitter are merely covered in a clear-coat, retaining their original black color. A polycarbonate window is placed in the center of the hood, allowing the engine intercooler to be seen from the exterior. The wheels were the largest ever placed on a production Corvette, with both front and rear wheels increasing in size and diameter over the Z06. Carbon-ceramic brakes are included. The brake calipers are painted blue, as are the engine intercooler trim and the ZR1 logo. Magnetic Selective Ride Control was also included on the car, with sensors to automatically adjust stiffness levels based on road conditions and vehicle movement. Optional 1LT, 2LT, 3LT and 4LT trim packages. Manual models, also including launch control. The LS2 was replaced by LS3 from model years 2008 - 2013. The LS3 engine in the GS convertible or Grand Sport coupé equipped with an automatic transmission has wet sump instead of dry sump lubrication. The Ron Fellows ALMS GT1 Championship Edition is a special edition of the Corvette Z06 developed to commemorate the victory of the Corvette racing team driver Ron Fellows at the 2007 ALMS GT1 championship. Notable exterior features include special Arctic White paint, red grand sport style stripes on the front fenders and red and silver hash styled stripes incorporating a maple leaf similar to the livery present on the winning car. The interior had a red interior and complimented accenting on the seats, console and door panels. The arm rest features Ron Fellows' signature. Only 399 were made with 33 destined to the Canadian market. The ZHZ was a standard Corvette equipped with the LS3 engine, 6-speed automatic transmission, vacuum actuated valve exhaust, F55 suspension and unique 7-spoke chrome wheels. It was developed for The Hertz Corporation's Fun Collection for 2008. 150 targa tops in 2008 and 350 convertibles were produced in 2009 in total. All cars were finished in yellow with a broad black stripe along the hood and roof. The GT1 Championship Edition is an optional package for the C6 that was unveiled in the 2009 New York Auto Show. It celebrates the Corvette C6.R's entry into the GT1 class of ALMS in 2009. This limited edition is based on either a 4LT equipped targa top, 4LT convertible or high performance Z06. Models wear the same velocity yellow "45U" body hue that adorns the C6.R or "41U" gloss black, along with a "Jake" graphic that spans the Championship edition's hood. Chrome wheels known as Gumby's are present on the targa top and convertible while the Z06 is fitted with chrome Spyder wheels. A body-colored spoiler shared with the ZR1 joins a "carbon pattern" engine cover, while a leather-wrapped ebony interior contains "GT1" embroidered on the head rests of the seats, the instrument panel and a center console armrest. Non-Z06 models also include a Z51 Performance Package and NPP Performance exhaust. Original production numbers were slated to be 100 units of each model in each color (600 total), each carrying a premium over the standard models. But actual numbers amounted to125 units in various numbers for each color code. This was due to the government take over of General Motors. In March 2010, Chevrolet announced that 500 units of the Z06 Carbon Limited Edition will be made available as a 2011 model beginning in Summer of 2010. The car would be available in two colors: Inferno Orange and an all-new Supersonic Blue. On the exterior, the car had black headlamps and mirrors, a ZR1-style spoiler, carbon fiber hood, and black carbon fiber rockers and splitter. Inside, the Z06 Carbon has ebony leather and suede seats with body color-matching stitching. Other improvements include Magnetic Selective Ride Control, a special carbon engine cover, 20-spoke black 19-inch front/20-inch rear wheels, and ZR1’s carbon ceramic Brembo brakes. Order code "ZLC" was an equipment package celebrating 100 years of racing heritage of Chevrolet. Offered exclusively in Carbon Flash Metallic, the Centennial Edition kit includes satin-black graphics and unique lightweight cast-spun aluminum Centennial Satin Black wheels that feature a thin red perimeter outline (on Z06 and ZR1 cars). All cars came with red brake calipers and featured Magnetic Selective Ride Control. Inside, the car featured ebony leather upholstery and contrast stitching while the steering wheel and armrests featured microfiber suede accents. The headrests have an embossed Centennial Edition logo and the steering wheel hub carries the same "Louis Chevrolet 100" graphic found on the car's B-pillar and wheel center caps. The Cadillac XLR is a luxury roadster that was marketed by Cadillac from 2004 to 2009 model years. Assembled in Bowling Green, Kentucky, the XLR was based on the Chevrolet Corvette's Y platform. Designed to be a grand touring offering, the XLR featured different exterior and interior design, standard adaptive suspension system, a 4.6-liter Northstar V8 engine, and a power-retractable aluminum hardtop. The Z06X was designed to be a factory built road race car similar to cars like the Porsche 911 GT3 Cup and Dodge Viper ACR-X. The concept car was built by GM with the help of Pratt & Miller Engineering. The Z06X features racecar components such as: carbon fiber adjustable rear wing, carbon fiber front splitter, full roll cage, fire suppression system, race seat, harness, carbon ceramic brakes, upgraded cooling system, polycarbonate rear window, adjustable coilovers, adjustable sway bars, and tow hooks; the radio, interior carpeting and sound-deadening materials have been removed. The suspension system was designed and supplied by Pfadt Race Engineering. The C6.R was a replacement for the C5-R, built by Pratt & Miller, and unveiled for its first competition at the 2005 12 Hours of Sebring endurance race of the American Le Mans Series. It came in second and third in its class, just behind the new Aston Martin DBR9 race car. It was put on display a week later at the New York International Auto Show next to the Z06. In 2006, the Corvette C6.R won both American Le Mans GT1 Championships: Teams and Manufacturers. On March 17, 2007 it won the GT1 class in the 12 Hours of Sebring. For Le Mans 2007, four C6.R's were on the entry list, the two Corvette Racing entries joined by single entries from the Luc Alphand Aventures and PSI-Motorsport teams. The heart of the C6.R, its LS7.R motor, was crowned as Global Motorsport Engine of the Year by a jury of 50 race engine engineers on the Professional Motorsport World Expo 2006 in Cologne, Germany. As the GT1 class dwindled, Corvette Racing switched to the GT2 class during the 2009 ALMS season. 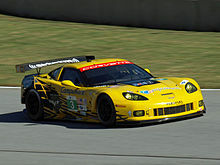 For 2011, the aerodynamics of the ALMS cars were modified to be similar to the ZR1. This car has since won the 2011 24 Hours of Le Mans in the GTE-Pro and GTE-Am classes. In 2012, the Corvette C6.R won again in the GTE-Am category. In addition to the American Le Mans Series, Corvette C6.Rs also race in the FIA GT1 World Championship. The GT1 cars are given more power and have less aerodynamics restrictions than the Le Mans cars, which follow GT2 regulations. Riley Technologies built a GT2-class Chevrolet Corvette for the 2008 American Le Mans Series. The car also raced at the 2009 Petit Le Mans, where it beat both Pratt & Miller-built factory cars in qualifying. Entered in the FIA GT3 European Championship series as a GT3 class car, the Z06-R is a modified production Z06. Changes were necessary to make the car endurance race ready. These include a stripped interior, full rollcage for safety, center-locking wheels, carbon fiber doors, rear deck spoiler and front splitter. The LS7 and LS3-engine and drivetrain are built by APP Racing Engines from the Netherlands. The car is not road legal. Eight Z06-R were constructed by Callaway Competition GmbH in Leingarten, Germany, for the 2006 season. The French team Riverside campaigned a three car team. In an effort to achieve parity among the disparate participants of the GT3 Series, three forms of handicapping were applied by the FIA regulators: additional vehicle weight, ride height, and tire compound selection. The Corvettes were raced with all three handicaps employed. The Z06R won the FIA GT3 European Championship in its second year of entry. By 2011, all Z06-R teams discontinued their racing efforts in GT3, ending the car's FIA career. Z06-Rs are also campaigned in national championships. ^ "2005 Corvette: "The First C6"". Super Chevy. Retrieved 17 July 2017. ^ "EPA estimate". Fueleconomy.gov. Archived from the original on 2011-06-14. Retrieved 2010-09-30. ^ "Six-Speed Manual Tremec T56 (MM6/M12) Car Transmission" ( DOC). GM. Archived from the original on June 5, 2011. Retrieved 2008-11-27. ^ a b "First Drive: 2008. 2009, and 2010 Chevrolet Corvette". Edmunds.com. 2007-04-27. Retrieved 2010-09-30. ^ "Last C6 Corvette rolls off the line". Autoweek. 2013-01-03. Retrieved 2013-04-22. ^ "EPA estimate". Fueleconomy.gov. 2006-09-10. Retrieved 2010-09-30. ^ Gritzinger, Bob. "Auto Week prototype Blue Devil photos". Autoweek.com. Retrieved 2010-09-30. ^ "Corvette Blue Devil (finally) gets a name - ZR1". Blogs.motortrend.com. Retrieved 2010-09-30. ^ Deaton, Jamie Page; Hall-Geisler, Kristen (3 June 2010). "Top 10 Speeds Clocked on the Autobahn". HowStuffWorks.com. Retrieved 13 August 2017. ^ "2009 Chevrolet Corvette ZR1 unveiled". Leftlanenews.com. 2007-12-19. Retrieved 2007-12-19. ^ Neff, John (2009-04-24). "Chevy Corvette Grand Sport returns for 2010!". Autoblog.com. Retrieved 2010-09-30. ^ Abuelsamid, Sam (2009-09-30). "Review: 2010 Chevrolet Corvette Grand Sport Convertible is just right". Autoblog.com. Retrieved 2010-09-30. ^ Siler, Steve (2007-02-01). "2007 Chevrolet Corvette Z06 Ron Fellows Championship Edition". Car & Driver. Retrieved 2019-03-18. ^ "Hertz Corvette ZHZ". Retrieved 2010-05-20. ^ "The Corvette ZHZ". Retrieved 2010-02-15. ^ Paukert, Chris (2009-04-08). "New York: Chevrolet Corvette GT1 Championship Edition gets called to the carpet". Autoblog.com. Retrieved 2010-09-30. ^ "Limited Edition 2011 Corvette Z06 Carbon". Automoblog.net. 2010-03-10. Retrieved 2010-09-30. ^ Csere, Csaba (June 2003). "2004 Cadillac XLR". Car and Driver. Retrieved June 21, 2017. ^ "Cadillac XLR Discontinued". US News. January 27, 2009. Retrieved June 21, 2017. ^ GM Media "2010 SEMA Chevrolet Corvette Track Car", retrieved on 2010-11-17. ^ Pfadt Race Engineering "GM equips Corvette Z06X, Camaro SSX with full suspension upgrades and chooses Pfadt Race Engineering" Archived 2012-03-15 at the Wayback Machine, retrieved on 2010-11-17. ^ "2006 Oscherleben Race". Vetteweb.com. 2007-02-26. Retrieved 2010-09-30. ^ "Victory in Dubai". Corvettemotorsport.com. Retrieved 2010-09-30. ^ Special Coverage – Primary Tank Module Flange Fuel And Vapor Leaks "AUTHOR: OEMDTC" Special Coverage Adjustment. Published August 24, 2016. Holmes, Mark (2007). Ultimate Convertibles: Roofless Beauty. London: Kandour. pp. 60–61. ISBN 978-1-905741-62-5. Wikimedia Commons has media related to Chevrolet Corvette C6. This page was last edited on 17 April 2019, at 08:15 (UTC).